Abraham, as a wealthy leader in the community, may have enjoyed trade with the Phoenicians, who sold a rare and beautiful blue dye. 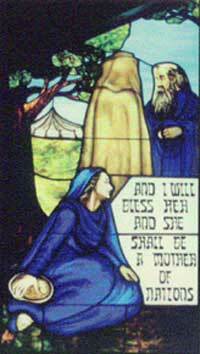 Sarah and Abraham’s garments are blue. His sash has three medallions, which are copies of circular designs found on Jewish ossuaries. Sarah smiles as G-d speaks. Her face reflects her joy. Her son’s name, Isaac, means laughter. The tent, in the background, indicates the home in which they lived when they were approached by the three strangers (angels) bearing news of Sarah’s pending motherhood.